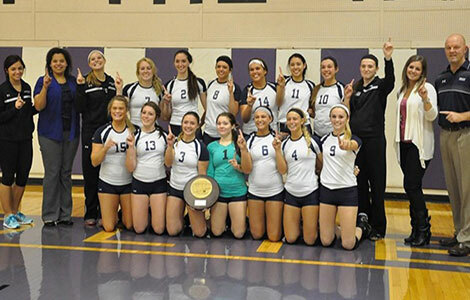 The Madison College volleyball team celebrations its victory in the NJCAA Region IV Tournament on Nov. 1. The WolfPack now advances to the NJCAA Division III National Tournament in Rochester, Minn., on Nov. 14-15. There are similarities between the Madison College volleyball team that won the national title last year and the WolfPack squad that will be playing in the NJCAA Division III National Tournament this year. Both teams won the North Central Community College Conference title. Both teams spent time throughout the season ranked No. 1, although this year’s squad enters the tournament ranked No. 2. And both teams lost just three matches throughout the season. But this year’s WolfPack team has something last year’s squad lacked – championship experience. Six players on this year’s team participated in the team’s national title run last year. Setter Hannah Grahn and middle blocker Mikayla Nigl helped lead the way a year ago and made the nationals all tournament team. Katlynn Wirag, Sydney Clarson, Courtney Frank and Brooke Gilbertson also played a part in the WolfPack’s title run last year. When the Madison College volleyball team heads to Rochester on Nov. 14-15 for the NJCAA Tournament, these players will have the opportunity to perform a rare feat – to win two national titles during their collegiate careers. Madison College earned the right to defend their national title by sweeping through the NJCAA Region IV Tournament on Nov. 1. The WolfPack defeated both Joliet Junior College and sixth-ranked Rock Valley College, 3-0. The WolfPacks’ returnees set the tone for tournament play in the first match, leading the squad to a 25-12, 25-23, 25-17 victory over Joliet. Grahn had 39 assists in the match, while Wirag added a team-high 12 kills and 10 digs. Madison College faced a stronger challenge against Rock Valley. The WolfPack prevailed, 25-22, 25-22, 25-18, to earn its third-ever national tournament berth. Freshman middle blocker Allie Lehner led the way offensively with nine kills. Grahn added 35 assists, while Wirag had 15 digs and Sydney Clarson added 13 digs. Three Madison College players were named to the NJCAA Region IV all-tournament team. Grahn, an All-American nominee, recorded 74 assists in the two games. Wirag had 19 kills, while Nigl added 16. Earlier this season, Grahn, Wirag and Nigl were also named to the N4C All-Conference First Team. Grahn finished the regular season with 830 assists. Wirag led the team in kills with 243, while Nigl had a team-high 54 blocks. Brooke Gilbertson and Sydney Clarson were named Second Team All-Conference. Gilbertson was second on the team in kills with 194 and first in services aces with 36, while Clarson had 546 digs. The WolfPack (27-3, 11-1) will be one of eight teams competing for the national title. Bracket play begins on Friday, Nov. 14, at 11 a.m. The championship is scheduled for 2:30 p.m. on Saturday, Nov. 15. All matches on Saturday, Nov. 15, can be viewed live on the tournament web site at http://www.rochsports.org/2014njcaavolleyball.